This track follows an ancient Maori trail. From Urquhart Bay carpark head left and follow the track as it climbs steeply up Mt Lion. Walking through the reserve you will experience some of the best coastal forest in the North Island. The undulating ridge track eventually intercepts the Peach Cove track. 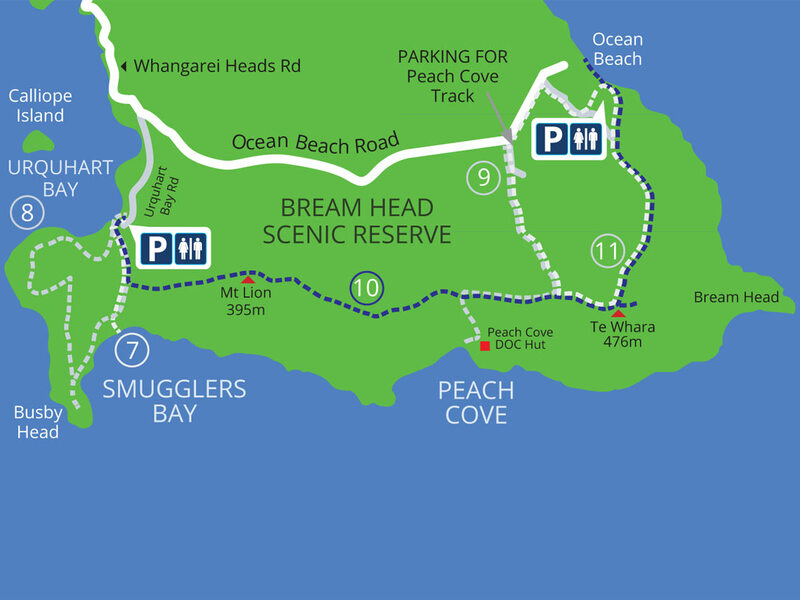 Carry on and climb the Te Whara/Bream Head Summit at 476m above sea level, and enjoy a spectacular, coastal 360 degree panorama taking in Motu Kōkako (Cape Brett) in the North to Tāwharanui (Cape Rodney) in the South. In between you can see Tawhiti Rahi and Aorangi (Poor Knights), Marotere (Hen and Chickens group), Hauturu (Little Barrier) and Aotea (Great Barrier) in the far east. Heading towards Ocean Beach you will pass the WWII naval radar station. Take in the views looking north towards Kauri Mountain. A well earned swim in the clear waters at Ocean Beach is highly recommended.